Hydro-Pac was founded in 1972 in response to an emerging market for compressors and pumps capable of achieving high pressures. Since then we have manufactured thousands of units for a variety of locations throughout the world. Our standard machines include gas compressors, liquid pumps and pressure vessels. 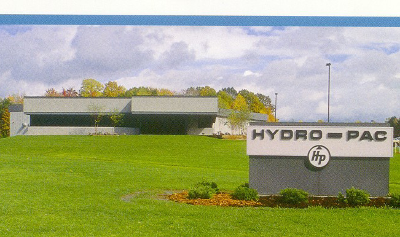 Our headquarters is located in Northwestern Pennsylvania at a 28,000 square foot facility. This facility consists of approximately 20,000 square feet of manufacturing space and 8,000 square feet of office space. From this facility, we sell, manufacture and service all of our equipment world-wide. 1. Hydro-Pac is certified to manufacture pressure vessels to American Society of Mechanical Engineers (ASME) Section VIII, Division 1, 2 and 3. 2. Through our sister company our products can be manufactured to meet Japan’s KHK high-pressure gas law. 3. Custom equipment can be offered to meet CE/PED (Europe), CSA (Canada), SELO (China) and other codes. Hydro-Pac, Inc. is committed to compliance with all United States export controls including Export Administration Regulations (EAR) for items classified as dual-use or commercial purpose items and the International Traffic in Arms Regulations (ITAR) for military use items. All sales and transfer of information to be in accordance with United States Export Adminstration Regulations. Diversion Contrary to United States Law is Prohibited.